It is hard to believe that Christian Rust, a rising-senior Park Scholar double majoring in chemical engineering and textile engineering, once questioned his ability to make an impact on a campus as large as NC State’s. But with a passion for service and human-centered innovation, Rust has come to the right place to leave his legacy. Inspired by his peers, he applied and was accepted into the NC State Stewards, which is supported by the University Sustainability Office. NC State Stewards promote sustainable practices within the community through workshops, presentations, and campus events. Divided into four committees, Rust chose to align with the Energy committee, having seen the success of their annual Tri-Tower Energy and Water competition in which the residents of Metcalf, Bowen, and Carroll Residence Halls (the Tri-Towers) have competed annually since 2014 to see which hall could most reduce its energy and water use. 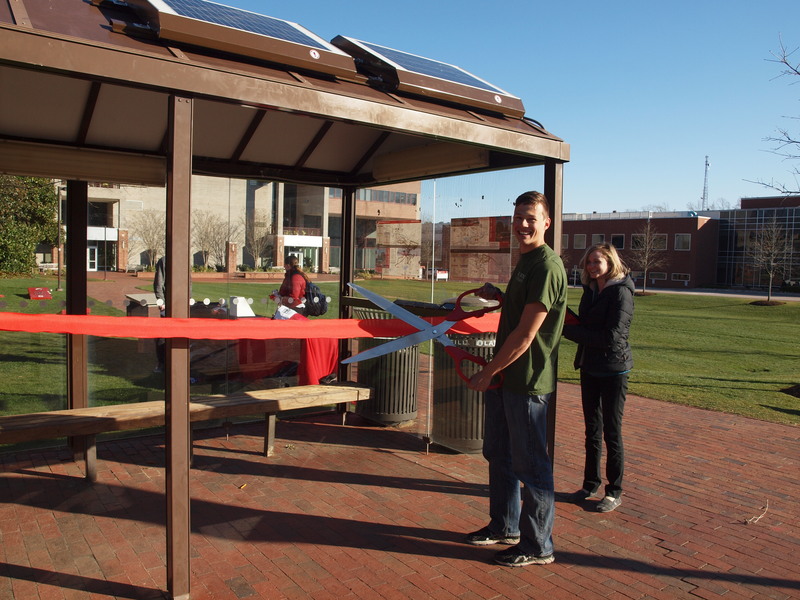 Rust assumed leadership on a project the committee had been dreaming of for two years prior to his becoming an NC State Steward — installing a solar array on a bus stop. By adding an array of solar energy panels on a bus stop, this would allow waiting riders to charge devices and potentially power lights as well as a computer display of bus routes and locations. The committee’s first task was to conduct a survey of NC State students to determine their opinion on the project. “With resounding results, we found students to be very supportive of the idea,” explains Rust. Virginia Tech University recently installed a similar system and referred Rust and his committee to Tolar Manufacturing in Corona, CA — a designer and manufacturer of solar transit shelters. Wanting to also have a local perspective, Rust contacted Yes! Solar Solutions in Raleigh for price comparison and additional options. In researching with these corporations, Rust discovered a limitation with his project: the TransLoc screen (that the University Transportation office maintains for bus navigation) only maintains Windows systems. A full Windows system and screen would consume a great deal of power that would have to be stored not just overnight, but also on days with greater cloud coverage. The dream of a TransLoc screen would not be realized for this project, but charging stations were still on the horizon! The team realized it was necessary to have a structural engineer evaluate the existing bus shelter to confirm it would be able to hold the weight of the panels. They had engineer Ed Levy, a project manager with NC State’s Design and Construction Services, provide shelter design dimensions and confirm the shelter could hold the weight of the panels. “I also worked with David Josephus from the Office of the University Architect,” Rust says, “to ensure that the additions of the solar panels to the existing bus shelter will function both mechanically and aesthetically. We then wrote a proposal to the Sustainability Fund who fully-funded the project. For the rest of that year, we hammered out the details of the system including the exact dimensions of the phone holder, the color the material needed to be painted, and the final purchase from Tolar Manufacturing.” The following year, the parts arrived and the committee installed the system, which is fully-operational and came in considerably under budget. The NC State Stewards have continued to hold educational events at the bus stop to encourage sustainable practices within the student body. “Probably the most memorable moment was when we first tested the system and it worked without a hitch. There had been so many different times when big issues came up in the project that could have stopped the project in its tracks. It was a huge relief to have the system implemented and working perfectly,” says Rust. Since the project was well under-budget, Rust and his committee developed a pilot project to help other groups interested in installing a similar system. They researched various electricity meters and eventually purchased a wireless multimeter from Horizon Solutions, LLC. After its installation earlier this academic year, the team collected data for the next four months and determined not only that the system is extremely reliable but also that it is in fact used daily. Rust will present the project at the National Conference of Undergraduate Research (NCUR) in Oklahoma City, Oklahoma in a poster session along with other undergraduate research projects. “After graduating, I would like to become a project manager on these same sort[s] of engineering projects. The solar bus stop was a great way to get experience in technical project management and I am excited to continue to share sustainable development with others,” he says.